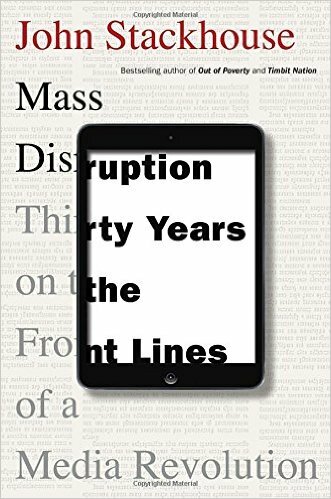 I just finished reading John Stackhouse’s new book, Mass Disruption: Thirty Years on the Front Lines of the Media Revolution. 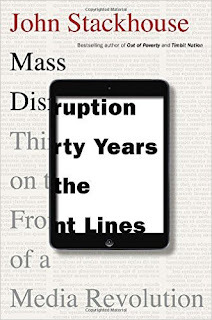 In it, Stackhouse—a long-time journalist and former editor-in-chief of the Globe and Mail--chronicles the steep decline of the newspaper industry, in particular, but all media, in general, due to the disruption caused by the digital age. He writes about how print advertising—the lifeblood of a newspaper—plunged from a high of $65.8 billion in 1999 in the U.S. to about $20 billion now. Some of those ads have moved online, but it doesn’t begin to cover the loss. For every $1 billion in lost print ad revenue, only $200 million comes back digitally, he says. At the same time, newspapers have seen their circulations fall, and newsrooms reduced by cuts. The digital revolution also changed newspapers in other ways. With digital, however, there was no need for whim. Editors and reporters knew exactly what people were reading. For example, the Globe found that roughly 40 percent of the paper was being read by only about 1,000 people—hardly comforting to those who worked hard to produce those articles. Some welcomed this new knowledge, he says, but not all. Some journalists still believed that they, not readers, should decide what is important and worthy of coverage. If this new reality is tough for journalists, it’s a boon for readers. We have never had it so good. There’s “an entire planet of information” at our fingertips, he says. Most of us get that information digitally, usually on our phones. Not through print, TV or radio. And few media outlets have figured out how to make money that way. The old model for sharing news was paid for by advertising. But advertisers no longer need newspapers (or other media) to reach customers. The tragedy for Stackhouse is that things could have been different. Journalists knew the world was changing back in the 1990s, but failed to start making the steps needed to adapt to the new digital world. Part of the reason is how well the media was doing well back then. Profits were high and things looked great. Newspapers made huge investments in new offices and print redesigns. And they went to war against each other. Stackhouse devotes a chapter, titled “The Wrong War,” to the huge competition between the Globe, the then-new National Post and the Toronto Star. But change is hard, says Stackhouse. And now it is being forced on them. It isn’t pretty. Anyone who cares about journalism grieves the losses of the many good people who have been downsized, and the publications that have closed. So: Will newspapers survive? That’s a good question. Stackhouse says the book is not an obituary. And readers? We “need to accept the cost of news—in time and attention, as well as in money,” he states. Stackhouse concludes by saying this crisis may have given everyone—publishers, journalists, advertisers and readers—the sort of wake-up call that was missed earlier. “There’s still time . . . to forge a better future for news,” he says. Is he right? Part of me hopes so, but part of me wonders if the world hasn’t changed so much and so fast that there is, in fact, no future for the kind of newsgathering institutions that once dominated the sharing of information. I also wonder if the appetites of media consumers have changed so dramatically that there's no longer any need for traditional journalists or journalism. Writers like Stackhouse, and other observers of the decline of the media, lament what the loss of newspapers will do for our society and democracy. But what if people really don’t care about the news as much any more? What if we’d really rather watch cat videos and read listicles about celebrities? What then? But those are different questions. Maybe someone will write a book about that one day. Thanks for this. What do you mean by "advertisers no longer need newspapers (or other media) to reach customers."? In the old days, advertisers needed the media to reach customers. Now customers can find them directly on the web, or through social media (including YouTube). It's a pull world now, not a push world, where businesses and charities had to push their messages to the public. Now the public pulls the information it wants, when it wants, how it wants. This doesn't mean that advertising doesn't still play a role, but it is diminishing as fewer and fewer people gather around the "hearth" of a newspaper, TV shows or radio. Advertisers have so many more options available to them than before. And if they do choose to advertise in the media, they won't pay the old rates since they have a better idea of how many people may actually see it.